Far Cry 5 is a big game with lots to do. It’s more open than its predecessors, so at any moment, you have a lot of choices about what you can do. We have some suggestions if you’re preparing make your way through Hope County, Montana. I’ve played the game for about 35 hours, and while I have by no means done everything in the game, I’ve certainly done a lot. The following tips are all based on lessons I and others at Kotaku learned so far on our journeys in Far Cry 5 and are aimed at beginners just getting into things. Once the game’s been out longer, I’ll update it with some more advanced strategies and hidden secrets to watch out for. Start the game by going West. Far Cry 5’s map is broken up into three regions. Once you’re off the game’s small starter island, you could venture into any of them. And if you venture into one, you can still step back out and go to the others. If you go north, you’ll encounter long stretches of mountains dotted with rivers and lakes. If you go east, you’ll find yourself surrounded by Bliss fields and constantly harassed by Angels, the game’s zombie-like Bliss-addicts. We suggest going west. That area is run by John Seed. It is the most straightforward to tackle and has a good variety of missions to do and people to meet. It’s also mostly flat, which makes it a lot easier to traverse when you’re just starting out and going most places on foot or by car. Plus, Boomer’s there. Buddies are back in Far Cry 5. Some of them are animals, including Boomer, a video game dog you can not only pet(!) but who will spot enemies, fight them, revive you when you’re down, and retrieve guns from fallen enemies while you’re taking cover. The game has other allies too, including one who flies an attack plane which, for obvious reasons, comes in very handy. But Boomer is one of the best and easiest to unlock, so there’s no reason not to do that right away. Immediately after finishing the game’s prologue on Dutch’s island, you can head southwest to a place called Rae-Rae’s Pumpkin Farm. There you’ll find enemy cultists, nicknamed Peggies. Kill them. Then search for a cage with a dog in it. Open it, pet him, and boom, you’ve got a new best friend. Now you can spend the next several hours walking around Hope County while everyone you pass comments on what an awesome dog you have. Plus, he’ll bravely defend you with this melee attacks against any other wildlife that tries to bumrush you. Everyone in Far Cry 5’s world exists for a reason, even if that reason is just to share an innocuous bit of information about a nearby hunting location. 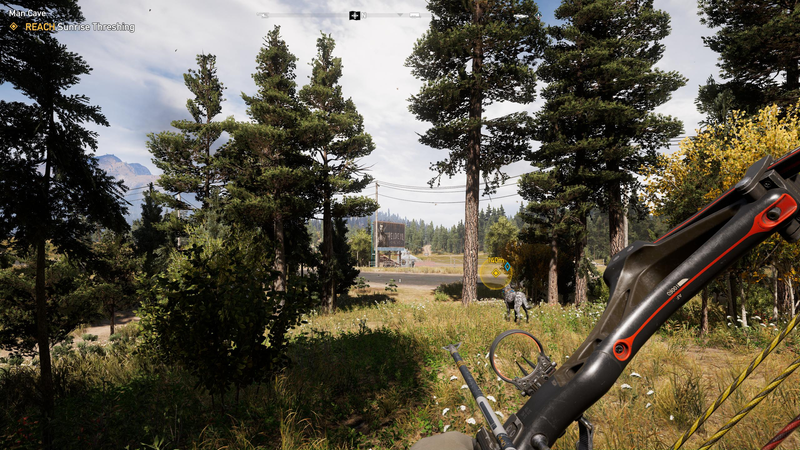 Unlike in Far Cry 4 where you unlocked portions of the map by climbing radio towers, Far Cry 5’s map gets filled in every time you visit someplace in person, read a map, or hear about it from a stranger. It’s one of the game’s better innovations and it goes a long way toward making exploration feel more natural. It’s also unintuitive. Most games have trained us to only pay attention to main characters stationed at particular places, with everyone else being just for show. In Far Cry 5 though you can go up to anyone and interact with them. Almost always they’ll give you a useful piece of information about the area you’re in that will then either add an icon to your map or a mission to your list you can go back and track later. Harvesting and lockpicking are two of the most useful perks. There are safes scattered all across Far Cry 5. All of them are filled with cash, some even with Silver, the game’s premium currency. A few have unique collectibles. You can always blow safes up, but that’s a waste of explosives. Plus, if you’re surrounded by enemies, it’s a surefire way to blow your cover. The lockpicking skill lets you open all of them with ease, in silence and without wasting items. Plus, it will also work on many locked doors you encounter while exploring. Harvesting is the other most useful perk. It lets you collect twice as much any vegetation or animal remains as you normally would after picking flowers or killing a furry beast. It effectively doubles your income. It’s also one of the more painless ways to stay stocked up on supplies for your homeopathics. You actually have two weapon wheels. One of them’s just hidden behind the other. On this second wheel are things like your fishing rod as well as homeopathics, Far Cry 5’s potion system. they give you superhuman strength, speed, and vision and are great not only for taking on enemy outposts but also keeping up with whatever animals you’re trying to hunt. There’s also a fake in-game version of weed, if you care. It’s called oregano. Take the road less traveled and don’t always rely on fast travel. There’s a lot of backtracking in Far Cry 5 across a map that’s huge. When you select a mission to embark on, it makes sense to simply fast travel to the nearest location and then commandeer a car to drive from there. Like I said earlier, though, exploring the map is an important way of unlocking new areas and missions. A lot of times it’s worth taking the long way around if the stuff in-between is still fogged out on your map. In many instances it’ll only add a few more minutes to the journey and you’ll likely gather helpful intel along the way. Prioritize a silencer for your pistol. The first time you go shopping, buy a silencer attachment for your starting pistol. It’ll make things a lot easier and is a good stealth compliment to the bow and arrow, which is terrible for taking out people at close range. It’s also the only way to have a stealth option early on if you if you, like me, prefer to play with a sniper rifle in your main weapon slot. Get an extra weapon slot. You can use perk points to unlock up to two more gun holsters. Doing so cuts down on tough choices when you’re out in the field, like deciding whether to carry a rifle and a shotgun or a machine gun and a rocket launcher. While a fourth weapon slot is kind of optional, I recommend getting at least a third early on. At the very least, this means you’ll no longer have to choose between a bow and a gun for your non-pistol slot. It also gives you that much more stamina in shootouts since you have a third weapon and set of ammunition to rely on. Always travel with at least one stealth weapon. Even if you don’t plan on using the bow and arrow or play the game trying to go about things sneakily, there are inevitably situations that arise where you want to be able to take out enemies without alerting everyone in a five mile radius to your presence. This is especially true late in the game when your resistance meters are filled high and Peggies all across the map are on high alert and constantly hunting for you. Maybe you’re hunting a grizzly when some Bliss-addled Peggy comes up behind your and starts screaming at you in the face. It’s great to have a silent weapon in these instances. Fish for easy perk points. You unlock new perks with perk points, which you get from completing challenges. Things like harvesting, lockpicking, and a third weapon slot are all expensive, so being efficient about which challenges you complete first is important. While a lot of them include things you’d normally do over the course of a playthrough, like kill 10 people with a shotgun, others like fishing are more off the beaten path. However, fishing challenges are also some of the quickest to complete, since you only need to catch one of a certain type of fish to fulfill the challenge, and each completion nets you up to a whopping three perk points, depending on the difficulty of the catch. Always check out new gun shops for maps revealing the locations of collectibles. Everytime you capture an outpost and liberate a different part of Hope County, you’ll see some sort of shop appear in the form of a little green icon. For vehicles it’s a phone hanging on a wall somewhere. For guns and other stuff it’s a store counter or folding table set up outside. Even if you aren’t low on ammunition or looking for a new ride, it’s worth checking these vendors out to see if they have any special items. Sometimes they’ll have maps that will provide the individual locations of collectibles linked to one of your missions. The same goes for wandering hunters out in the wild. These people are great for unloading extra animal skins while out scavenging or stocking up on medicine kits. T and they also on occasion have maps or other information to share. Wait until you have a plane or helicopter to take on missions where you need to blow things up. The game often tasks you with One type of mission in the game revolves around blowing up Peggy buildings and transports. Usually, you have to find these things, then destroy them. There’s no pre-marking on your map. While you can hunt for all of this stuff on foot or in a car, it’s much easier and more efficient to blow it all upknock all this stuff out once you have access to the air. Planes and helicopters also make it easier to explore distant locations that look like they might house something interesting, as well as get to places with no fast travel marker nearby. You’ll unlock aircraft naturally as you progress through the story. They which can then be spawned anytime at designated airfields and landing pads, or you can simply buy them once you’ve saved up a few thousand dollars. Once you have the harvester perk unlocked, this should be easy enough. Just make sure when you do you get one with a gun on it. Learn to cook the grenades effectively. Grenades cook fast in this game. Hold onto one for more than a few seconds and you’ll get hurt (though this will rarely actually kill you outright). This tip isn’t just for safety reasons, though. Grenades are also the best way to take down enemy helicopters which hang stationary in the air while shooting at you. All you have to do to bring it down is time the grenade to explode somewhere in the vicinity of the chopper and it’ll usually send it into a tailspin. This technique also works against fighter planes when they’re making an attack run, although the window of opportunity is smaller. Don’t sleep on the Prepper missions. When I first started playing I ignored a lot of the game’s Prepper missions. They revolve around discovering and gaining access to hidden survivalist caches full of supplies and collectibles. but usually require you to go off the beaten path and don’t involve much killing. As a result, I figured I’d double back on them later. This was a mistake. These missions, which usually involve some light puzzle solving and 3D platforming, are some of the best that Far Cry 5 has to offer. The game’s open world is huge and it’s easy to get overwhelmed and just focus on obvious stuff like taking out enemy outposts. Prepper missions are a great alternative to that though, and they also force you to slow down and interact with the world in a more methodical way. They usually involve solving some puzzles in the environment or solving a platforming challenge. They’re a wide range of them. It’s worth taking some time early on to give these a try, as the stuff you find there often ties into other characters and story missions in interesting ways. Find them by looking for icons in the shape of diamonds. Read the inventory descriptions of stuff you pick up. When you’re fighting for your life trying to liberate an outpost while truck after truck of new enemies show up, it’s easy to just run through a room looting it and forget later about everything you picked up. You may have grabbed some magazines or bobbleheads without knowing it. A lot of times though it’s worth checking through your inventory to see the flavor text for this stuff. The same goes for hunting and fishing. What could possibly be the point of checking that bear skin or trout you just added to your inventory? Well, at last in some cases there are witty or interesting or absurd descriptions attached to them, none of which I’ll spoil because the ones worth sharing are worth discovering on your own. If you want to fill you resistance meter up quickly, stick to capturing outposts and story missions. The main goal of Far Cry 5 is to fill up your resistance meter to initiate confrontations with Joseph Seed and his siblings, each one of which controls a part of the map. Just about any activity in the game contributes to filling up this meter, but not all of them do so equally. Rescuing civilians on the side of the road, while an important activity that can unlock new missions, will only give you 50 points while capturing outposts will grant you 400. Most sidequests, meanwhile, give somewhere in the neighborhood of 200, so if you’ve already finished the story missions available in an area, completing those is the next best thing. If at anytime you find yourself wanting to push ahead in the story but struggling to fill up your meter, focus on mainlining these activities. Liberating outposts is an especially quick and efficient way to make progress in this area of the game. Don’t be afraid to turn the difficulty up. Far Cry 5 is a game that likes to kill you, but it isn’t hard. Most deaths are the result of weird experiments gone bad or glitched out enemy AI and not unfair odds. With the exception of a few story missions, everything in the game can be approached with guns blazing or stealthily, and you can always run away if things go south. Raising the difficulty to hard, at least a few hours into the game, is a good way to break you out of the monotony of taking on your 10th Peggy outpost. By the time you have unlocked the ability to have two hired guns unlocked and accompanying you at all times, as well as gun mounted trucks, RPGs and heavy machine guns, putting the game on Hard is a good way of restoring some balance to a progression system. Otherwise, after a while you’ve just got too much of an advantage. While there’s plenty more to do in the game, these tips should be more than enough to get your started and see you on your way to becoming a deadly but friendly Hope County resistance fighter. Be sure to share any great tips of your own in the comments.